Some time ago my wife and I were discussing insurance. In the midst of the discussion, I mentioned that I should get a special policy for my liquor cabinet. If I remember correctly, she chuckled as though I were only kidding. But I’m not. The conversation started in that typical vein which asks, “If we had a fire, what would you try to save on the way out?” Of course I responded that I would seek out the children and move them swiftly to safety, but I must admit that it took everything in me to keep from saying that I would make sure all four of them had backpacks just in case we were able to make a stop on the way out. I may need to jump through some flames and open the whisky cabinet and toss a few bottles to the little ones to carry out while I grabbed as many as I could. Oh yeah, and as long as it wasn’t too hot and I had enough room, I might try to carry a photo album or two. But only if I had the room. One of the bottles I’d seek ne’er to forsake, even bearing the possibility of a significant singe to body hair, is the Glenmorangie Astar. It is a pleasant and lovely resident in my home, one I’d struggle to sacrifice to an unholy pyre without a fight. The word “astar” is Gaelic for “journey.” Indeed, the nose of this sweet endearment begins your bountiful travels with joyful fruitiness kissed with sweet spice and vanilla. 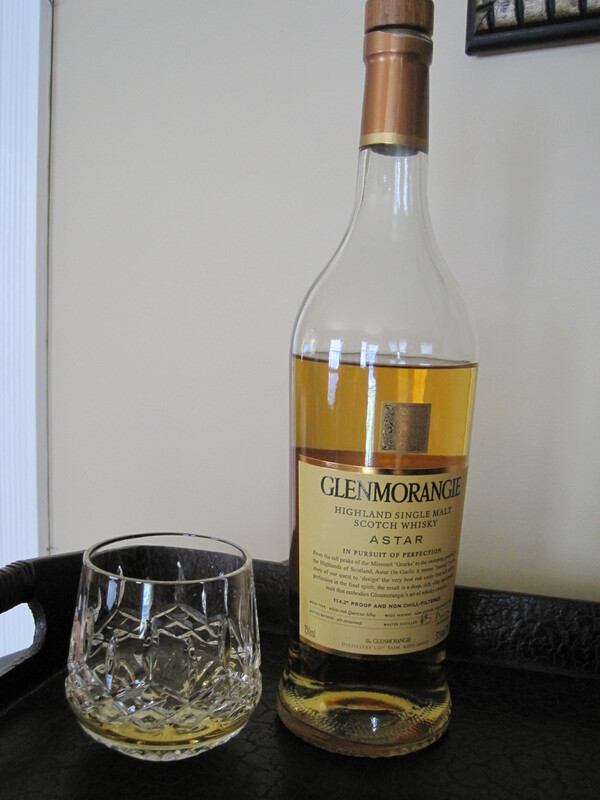 The palate undulates with the typical Glenmorangie citrus – most definitely oranges and maybe even a plum or a pear. The finish, exquisite–and if it were possible to say that any whisky was thirst-quenching, the Astar is just that. This begs the dram to be refilled that the refreshing journey may begin again. I doubt that the average Joe has as many designate whiskies bottles as I do resting in their liquor cabinet), so the children/Scotch/fire conundrum may only fit someone in a like circumstance. But what I can say is that if you have the typical liquor cabinet line-up – that is, evenly stocked with spirits like gin, tequila, vermouth, etc., the Glenmorangie Astar would be a fine candidate to meet any vacancy in your cabinet’s whisky row. So if the unthinkable happens, while the other bottles are beginning to pop and fizz from the rising heat, no time would be wasted in decision-making if you had a bottle of Dewar’s for mixing and a bottle of Glenmorangie Astar for sipping. Take a deep breath (from below the accumulating smoke, of course), jump and tuck high through the flames, kick open the cabinet and grab your Glenmorangie…and then maybe grab a few sentimental things, too. Once outside, be sure to grab a Red Cross blanket as soon as they arrive in order to hide the bottle. You never know if a closet connoisseur exists amongst the rescue workers. He may see you with your beloved possession, become distracted, and ask for a sip, forgetting all about his job of putting out the flames or tending to your family. Heaven forbid his attention be drawn inappropriately and his priorities be askew in the midst of such a tragedy.